Blood Washed Away marks the penultimate episode of season two. Cole and Cassandra have splinttered back to 1957, in the hope of stopping the paradox which destroys the Splitter facility and kills Jones. Yes, please find a way to bring back Jones because other than Jennifer, she's the only other interesting and likable character. Things are desperate, but with eight months until the paradox happens, Cole and Cassandra are hopeful that they will be able to find the Primary. Cole and Cassandra both take jobs at the factory where the Primary is killed and start questioning their coworkers, looking for the typical signs exhibited by Primaries. Despite the fact that Cassandra chose to go to 1957 with Cole, there's clearly still a lot of tension between them. It isn't helped by the fact that Cassandra is sexually harassed on a daily basis and those around her basically view her as harlot, given the number of men she's been forced to date in order to research them. I gotta say for the record, I love the way that Cassandra handled her boss. I'm quite sure that there isn't a woman who's been inappropriately touched who didn't cheer for Cassie in that moment. Time quickly runs out for Cassandra and Cole and they find themselves only two days away from the paradox moment and are no closer to finding out who the Primary is. At this point, I really think that the writers did a terrible job with foreshadowing because the moment Cole ran into Charlie in a bar and Charlie starts talking about wanting more time with his wife who is dying of cancer, it became readily obvious that Charlie was either the Primary or somehow connected with the Primary. Sure enough, while Cole is busy chasing a false leaded which Charlie planted for him, Charlie's wife walks into the factory carrying a box containing her bones and a gun. When Charlie's wife appears with the box and the gun, it's Cassie who confronts her, only to be quickly overpowered by Charlie. That's right, Charlie is a Messenger and though his wife is certain that this is the day that she dies and that she will see Charlie in the red forest, Charlie is less sure now that he has fallen in love with his wife. Charlie argues that The Witness has been wrong about a lot of things. Cole shows up now that the alarm has been sounded but it turns out that this is just the push that Charlie needs to kill his wife. Cole and Cassie run from the explosion but Cassie is injured. I'm really not pleased that Charlie's wife turned out to be a Black woman given how many people of colour die in this episode. Her character, basically existed to die for the sake of the story and beyond being a Primary was given absolutely no characterisation. 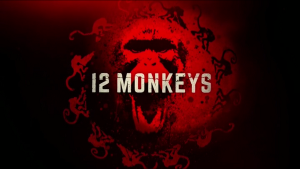 I know that 12 Monkeys doesn't seem to prioritize their characters of colour but this just really takes the cake. Also, I didn't catch the state that this supposedly took place in but anti-miscegenation laws could well have made this marriage impossible. Somehow, I doubt that 12 Monkeys thought this through. Cassie spends a great deal of time in a coma after the explosion and Cole decides to disappear in the hope that now that Cassie is free of him, she will choose to lead a good life and find love. When Cassie awakes, it's a shock to her doctors. Unable to find Cole, Cassie works as a nurse while she studies for a medical degree, constantly astounding her superiors with her medical knowledge. Of course Cassie knows more than them, she has the benefit of having been a practicing doctor in 2016. Cassie's unwilling to give up on Cole and manages to track him down, only to find him living in the exact house that the witness showed her. Yes, the same house which Olivia had told Cassie that she had been to before. When Cassie drives up, Cole cuts his hand and the blood drips on the ground. It begins to rain, washing away the blood on the grass. Cassie is certain that it's no accident that Cole has decided to buy this house but cannot put the pieces together. Instead of talking about the upcoming destruction of the world, Cole wants to talk about his relationship with Cassie. Now that they don't have the future looming over them anymore, Cole suggests that Cassie no longer has reason to run from the feelings he has for her. Cassie gives in and the two make love. I know that the will they or won't they thing has been going on for awhile, but I personally wasn't ever heavily invested in it. So yeah, some fans were happy by this. In the 2045, Ramse, Whitley, Hannah, and Jennifer and the sisters are making their way toward Titan. Along the way they have to battle with local warlords and the going is not easy. A sister is forced to sacrifice herself to save Jennifer's life and Jennifer is ill equipped to deal with it. The sisters want her to play the role of Mother, but Jennifer is far removed from the older version of herself who died last week. Jennifer is using fortunes from cookies as her wisdom and clearly is not convincing the Sisters to keep moving. Fed up with Jennifer's lack of real leadership skills, one of the Sisters challenges Ramse to a fight which she predictably loses, forcing Jennifer to beg for her life. It's enough for Jennifer to publicly admit that she is in over her head and pulls the support of the Sisters away from Ramse. Ramse will not be stopped and Hannah decides to accompany the remaining members of the team. They make it to Titan and confront a robbed figure, who quickly kills Ramse. The team then finds themselves surrounded and in turn, Hannah, Whitley and Deacon have their throats slit. The camera focuses in on Ramse as he takes his last breath. 12 Monkeys had better have some way of reversing Ramse and Whitley's death. 12 Monkeys has never really been great with inclusion and by killing off these two characters, they'v effectively killed off 2/3 of their characters of colour, leaving only 1 Sister of colour alive. I originally thought that Sam was the Witness given the fact that he was separated from his father but this episode leads me to believe that the Witness is actually Cole. Why else would he buy that house? Could he have made the same selfish choice that Ramse did when it came to his son? Did Cole somehow become the Witness to stop Cassie from dying in the plague? Hmmmm. I suppose next week we'll get the long awaited reveal. Though Cole and Cassie are currently stuck in 1957, we know that they have to find someway out of there. The simple fact that Cassie dies in the future means that this must happen. If I were Cole, I'd make sure to get my fill of the good booze now. That being said, at the very least, I hope that the next episode will explain why it is that the show shifted away from the virus to deal with the Messengers. It took away a lot of the continuity as far as I am concerned. It's like the characters forgot the menace that the virus became. Sure, the writers alluded to the fact that some were disillusioned by the search for the Messengers but it was not enough to deal with this bait and switch the show had going on. They need to give us some reason to care about the red forest. Yeah, I know the whole destruction of the world thing but why bother saving it if everyone is going to die from the virus anyway?